In the NBA, it was Game 2 in the series between the Philadelphia 76ers and the Boston Celtics. The Sixers trailed 1-0 in the series, and were lucky to have a seat in the 2nd round thanks to the injury that sidelined the Bulls Derrick Rose in Round 1. That essentially gave the Sixers a ticket to the 2nd round. But, in Game 1, the Sixers got beat up by the Celtics and found themselves instantly in a hole. And, in Game 2, the Celtics looked to build on that momentum. In the first half, it was all Celtics, as thanks to Rajon Rondo’s 13 assists, the Celtics had their way with the Sixers. It was set to be a route, BUT the Sixers came surging back late in the 4th quarter. Kevin Garnett was the star for Boston with 15 points and 12 rebounds, but in the end, he had made a horrible offensive foul which allowed the Sixers to hold on to the lead and grab Game 2 on the road. Philadelphia 82, Boston 81. And, in the second game of the double-header, it was Game 1 of the Los Angeles Lakers vs. the Oklahoma City Thunder. The Thunder have been dormant for a week, awaiting the winner of the Nuggets/Lakers series. Now, on short rest, Kobe and the Lakers had to travel to OKC to take on a very hungry Kevin Durant and Russell Westbrook. Well… this game wasn’t pretty. From the very beginning it was a slaughter. The Lakers simply had no answer for the Thunder. Westbrook had 27 points and 9 assists on the night, which definitely helped the Thunder maintain essentially a 30-point lead throughout most of the game. The Lakers are going to have to make adjustments for Game 2 if they hope to have any semblance of a chance in this series. OKC 119, LA Lakers 90. And finally, some scary news out of Miami. 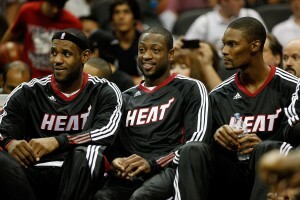 This is the year where the Heat think they have a fantastic chance to win the NBA title. They have 3 amazing stars and a road to the championship that isn’t that difficult (relatively speaking). But, in Game 1 of their series against the Pacers, their star power forward Chris Bosh went up for a dunk and pulled an abdominal muscle. The only cure to this is a prolonged period of rest. Essentially lying on your back for 4 to 6 weeks. That would basically put Bosh out for the rest of the playoffs. However, there is another option, which is to take a medical shot that alleviates the pain, but would make Bosh more susceptible to a more serious injury. If they do in fact lose Bosh, they are in serious trouble, as they need his low-post presence to defend Indiana’s big men. This just goes to show you how difficult it is to win an NBA Championship. We’ll see what happens here, but he is definitely out for Game 2.